To truly understand the ocean ecosystem, at some point you have to get in a boat. From the early days of oceanography, scientists have used boats of all sizes to take them to the places they wish to study. Once there, they can collect water samples from which any number of analyses can be performed. During a recent research trip to the Southern Ocean, Dr. Alex Kahl and Elizabeth Leonardis used a small boat and special bottles to collect waters samples off the coast of the Antarctic Peninsula. They then brought the samples back to the lab to be filtered, which extracts and concentrates the phytoplankton in the water for further analysis. But while this may sound easy, Alex and Elizabeth created this travelogue, to show us how they collected and tediously processed just a few samples of the ocean. 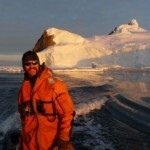 To find out more about Alex and Elizabeth’s research in Antarctic, check out their Antarctic Summer Blog.